The past couple weeks haven’t seen a ton of painting or hobbying from me. I’ve been starting up on the Partisans, but definitely lagging behind Andrew, who has been working like a madman! I have a lot of free time coming up in the next week or two though so I should be able to knock out some progress on them. We also have at least one of our orders for more Partisan models coming in by Saturday, so we’ll be doing a hobby day to get to work done on those since that’ll be another 20+ minis. 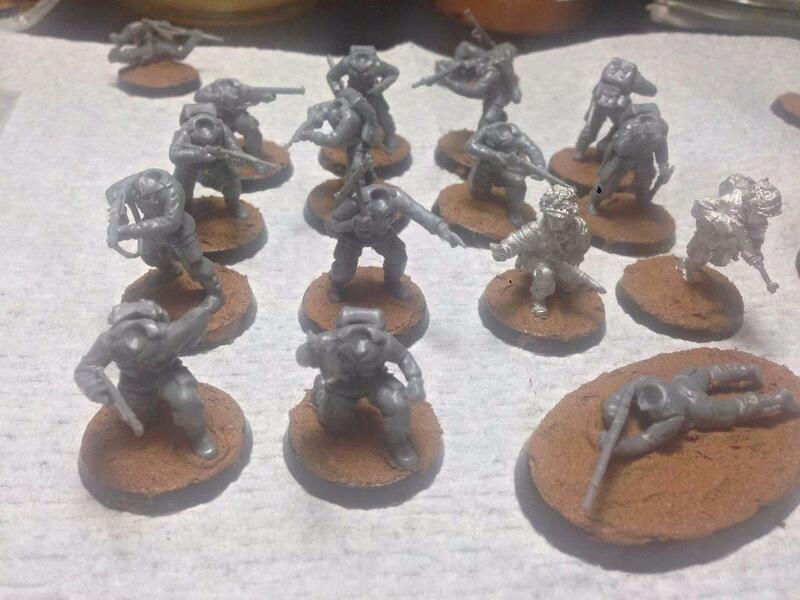 I started work on the basecoats for my partisan SMG squad, and will be starting washes and layers/highlights on their clothing tomorrow along with finishing the rest of the clothing basecoats. I realized that I left a lot of my colorful paints back in the parents garage during my last move, so I had to swing by there and pick those up. Lately I’ve been painting nothing but greens and browns for USMC and the like and haven’t needed most of my paint collection. Yesterday I was also did some work on the Airborne I’m working on for combat patrol, setting up the bases for 20+ of them. I’m considering redoing them using the Games Workshop Stirland Battlemire. I’ll be snagging some of it this weekend to test on a few bases and make a decision so I can start the painting process. That’s it for me for now, I’ll be posting pictures as I start rolling up serious progress in the coming days. Also I realize the picture quality is poor, I’ve been looking into getting a better camera, since my iPhone is old and takes blurry ones now due to smudges on the lens. Or I might just upgrade the phone and kill two birds with one stone. Either way, I’ll try to ensure picture quality is improved in future posts! I’d highly recommend Stirland Battlemire Ben. It’s really good for rugged battlefields. I got pics of a model I did with it if you’d want to see.